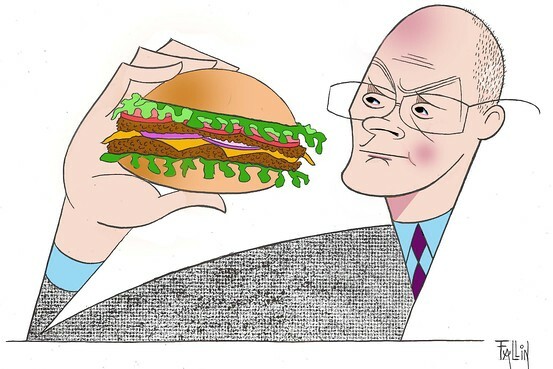 Even those who have never frequented one of Mr. Puzder’s fast-food restaurants—known as Carl’s Jr. west of the Rocky Mountains, and as Hardee’s in the Eastern U.S.—will be familiar with his dude-centric brand. How could anyone forget their Super Bowl ads? The robust marketing has helped revive a company that a decade ago was still suffering a $700 million debt hangover after purchasing Hardee’s in 1997. Since Mr. Puzder took charge in 2000, CKE has grown consistently. Revenues have increased by 3.6% over the past year to about $1.3 billion, and its international restaurant count has grown by more than 15% annually over the past three years. Mr. Puzder is quick to point out that many of his competitors aren’t doing as well and the U.S. economy remains underpowered. Government policies, he says, are stifling young, hungry entrepreneurs, and he doesn’t mean tech hotshots. He means the kind of entrepreneurs who run fast-food joints, often immigrants and minorities without much education. In other words, the very people that liberals say they want to help. The fast-food executive rattles off a list of market suppressants, including uncertainty over labor costs, commodity and food prices, and taxes. But his bete noire is ObamaCare. Mr. Puzder says his health-care consultants have calculated that it’s cheaper to offer his company’s 21,000 U.S. employees more expensive health-insurance plans than to drop them into state exchanges and pay the penalty for not covering what ObamaCare regulators deem are “essential health benefits.” Yet his consultants can’t figure out how many people will sign up under the new plans because the Health and Human Services Department hasn’t issued final regulations. Only 63% of CKE’s general managers are currently covered by the company’s insurance plan, and a mere 6% of regular workers enroll in its “mini-med” plans, which are prohibited under ObamaCare because they include benefit caps. A lot of fast-food executives and corporate leaders got their first business lessons while working at fast-food restaurants. For instance, former McDonald’sMCD +0.32% chairman and father of the Chicken McNugget, Fred Turner, started out by flipping burgers in 1956 at a restaurant in Des Plaines, Ill. Retired McDonald’s CEOJim Skinner also began as a burger grunt. Mr. Puzder admits that he’s an exception. In the 1990s, Carl’s Jr. founder Carl Karcher hired him as his personal attorney and then as company general counsel. When Karcher found out, as Mr. Puzder puts it, that “he was in deep financial trouble,” Mr. Puzder helped design a deal with Bill Foley at Fidelity National to save his boss from financial ruin. Three years after CKE nearly went bankrupt from acquiring Hardee’s—the stock price had plummeted to $2.85 per share in October 2000 from $42 in July 1997—Mr. Puzder was elevated to CEO. Why was he chosen? “The board decided that maybe I would be the best CEO because I was the only one who thought that converting Hardee’s to Carl’s Jr. wouldn’t work,” Mr. Puzder says with a shrug. Instead of taking the company into bankruptcy, which Mr. Puzder says wouldn’t have benefitted anyone, he focused on improving quality, service and cleanliness. He also streamlined Hardee’s complex menu. “We fixed those things, and brought a bunch of girls in bikinis into ads and it worked out great,” he says. In 2010, he took the company private with Apollo Global Management APO +1.27% in a deal valued at $1 billion, which was about four times the market cap when he took the reins in 2000. Mr. Puzder says he wanted to invest more in the business and didn’t think shareholders recognized the company’s value or growth opportunities. Fast-forward a few years. The company, which was dubbed most improved burger chain by consumer research firms Sandelman and Technomic last year, is expanding rapidly. It has 3,300 restaurants in 42 states and 28 foreign countries. There are 248 sites in the Middle East. This year the company is looking to expand into Europe and Northeast states like New York and New Jersey. Still, he says, it’s much easier to grow in business-friendly places like Texas, where the company plans to open 300 new restaurants by the end of the decade. Restaurants in Houston and San Antonio hold the company record for highest first-week sales in the U.S. “All those records used to be in California,” he notes. These days, California is one of the few states where the company isn’t looking to expand. “Like many businesses, we love California and would love to build more restaurants,” he says. But “California is not interested in having businesses grow,” even though many multinational companies, including CKE, have headquarters there. Consider how long it takes for one of his restaurants to get a building permit after signing a lease. It takes 60 days in Texas, 63 in Shanghai, and 125 in Novosibirsk, Russia. In Los Angeles, it’s 285. “I can open up a restaurant faster on Karl Marx Prospect in Siberia than on Carl Karcher Boulevard in California,” he says. Then there are California’s cumbersome labor regulations, which appear designed to encourage litigation. The company has spent $20 million in the state over the past eight years on damages and attorney fees related to class-action lawsuits. The managers hated the change “because they worked all their careers to get off the base to become managers,” he says, and paying themselves overtime could hurt their restaurants’ bottom lines and chances of a bonus. Mr. Puzder adds that his company must now fire managers who don’t report their work hours because they present a legal risk. He tells the fired managers “to go to Tennessee or Texas, where we’ll rehire them and they’ll learn entrepreneurial skills.” General managers for CKE restaurants earn on average $50,000, Mr. Puzder says, and can make 100% of their salary in bonuses. Corporations based in California, including Silicon Valley sweethearts eBay,EBAY +1.50% PayPal and Google, GOOG +1.26% are increasingly employing their capital where labor and the cost of doing business are cheaper. The ultimate victims are middle-class entrepreneurs, like restaurant managers, and the low-skill workers they employ. ← Deloitte: Are Small Business Insurance Buyers Ready to Take the Direct Sales Route?